As the pastor of Central Christian Church in Las Vegas, Jud Wilhite encounters new Christians every single day. One of the greatest needs new believers have is a resource for understanding the Christian faith and the Bible in a straightforward and applicable guide. The Uncensored Truth Bible for New Beginnings fills that need and show an uncompromising commitment to God's Word and the extent of His grace: the radical, amazing, overwhelming favor and forgiveness of God available to all. The New Living Translation is Jud's preferred Bible translation because he believes it is the easiest for new believers to understand. This fastest growing Bible translation is the work of 90 Bible scholars over a seven-year period and is known for accurately communicating the meaning of the original ancient Hebrew and Greek texts in clear and concise language. 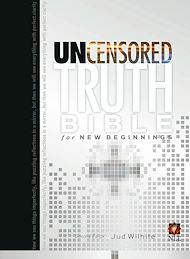 Jud hopes The Uncensored Truth Bible for New Beginnings will help you apply the gift of God's words to your life along with some thoughts to help you understand it more quickly and deeply. He gives you tools and resources to help navigate the deep waters of this living document. As you dig into God's words, the encouragement and truth you receive will literally change your life and the world!